A detailed flow report displays general properties like name, description, DM release, creator, and modify date. It also provides specifics on SQL Select Statements, target information, load options, target transformations, and execution properties. These reports are useful for documentation purposes. Detailed reports are available for individual flows from the DMC. You also can generate detailed reports for all of the flows in the path of the server, or in a specific application directory from the Web Console. The log file for a flow is useful in determining problems encountered when running a flow. Right-click a flow in the navigation pane and click Flow Report. The flow report shown in the following image appears in the workspace. It can be printed from that window. Tip 1: You can also copy the report to the Clipboard and paste it in Word or any other word processing program. To do this, right-click the report and click Select All. Then right-click and select Copy. You can now paste the report into another program. Tip 2: If you need to export the flow information into an XML file, you can use the stored procedure flow2xml, which is located in the ibisamp application directory. The following steps show how you can use this procedure and send the complete flow information into an XML file. 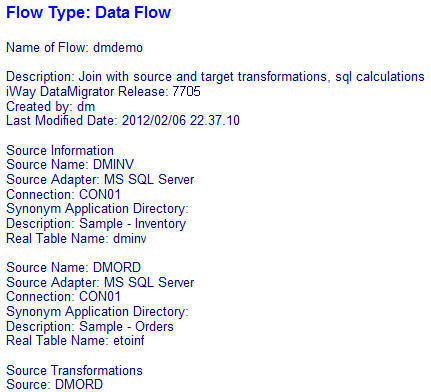 Right-click the flow2xml flow in the ibisamp directory and click Run. A dialog box opens. In the first line, enter ibisamp as the name of the application directory. 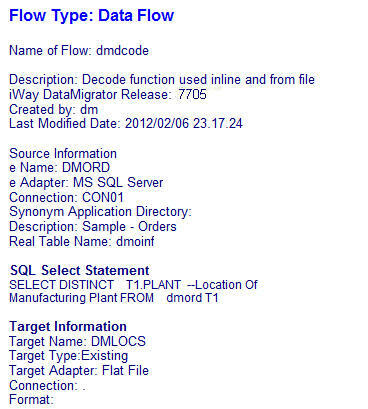 In the second line, enter dmdemo as the name of the flow. Note: These values are case-sensitive. The procedure will run. If it runs successfully, the following message will appear in the Console Log: The XML file fl_xml_*.xml created; located in the same directory where your flow is. The fl_xml_dmdemo.xml file will be inside the ibisamp directory. You can generate detailed reports for all of the flows in the server path or in a specific application directory. Note: If there are many flows in this report, it may take a while to generate. Right-click the server or an application directory, select Impact Analysis, and then click Flow Report. Select Detailed from the context menu. For output in default format, the first report is displayed. On the Report tab, in the Run group, click Next Result to view the next report, and continue until you have viewed all the reports. For pdf output, a single multi-page document is displayed. The flow reports appear in the workspace, as shown in the following image. Note: The Next Result common in the Run group, on the Report tab, lets you navigate to the next flow report. You can generate a log file for reports that have been run. Right-click a flow in the navigation pane, select Logs, and then click Log and Statistics. The Log and Statistics dialog box opens. From the Report Type drop-down menu, select Log. Specify what time range you want to run the report for. The options are Last, All, or Specify Time. The log report appears in the workspace. This example contains sample lines from log files, and an explanation of the code. The first lines of a log display DM job initialization. Request - one (Owner: dm) submitted. The next lines display the data target or file type, and whether it is a new or existing data target. The log then displays summary data for the request. You can see the number of records that were processed. In this example, there were 200 rows processed, which DataMigrator attempted to insert into the target table. Of those, 20 were rejected due to duplicate keys, and 180 were accepted by the data target. The remaining lines contain summary data and the return code from the flow.